Home » General Health » How Long Do Bruises Last? How long do bruises last? It all depends on where the damage was done on the body and how forcefully. More than that, it varies from person to person as some people are more sensitive to bruising than others, and some people heal faster as well. When a capillary (a tiny blood vessel under the skin) bursts or breaks due to some trauma or impact, a bruise is left behind. It’s the result of blood from the capillaries pooling into the damaged area that causes the telltale discoloration. Shades of blue and purple are the first stage, and then as it heals it moves to yellow and green. Bone bruise symptoms can also vary from one person to the next. Is it Possible to Have a Permanent Bruise? Who Is at Risk of a Bruise? A long-lasting bruise is not typical. If after four weeks, the bruise is still visible and there is pain, it means that the injury is worse than originally thought. There is also the chance that the bruise isn’t healing because of an underlying medical condition such as diabetes or hemophilia. So–how long do bruises last? How long a bruise lasts depends on the site of the bruise, the impact behind it, and the individual’s ability to heal—everybody is different, so there is no one simple answer. The elderly, for example, bruise far more easily than children and adults up to 60 because their skin is thinner and their blood vessels are generally more fragile. Women typically take longer to heal from a bruise than men do, and bruising can easily run in the family. Certain medications and illnesses also play a part in how long a bruise will stick around. So, how long does a bruise last? Most bruises take anywhere from two to four weeks to heal completely and disappear. Leg bruises tend to linger longer than bruises on the face and arms. Some herbal ointments, such as those containing Arnica, can speed up the healing process. If after four weeks there is still discoloration and pain at the site see a doctor to rule out any underlying medical conditions. Below are a number of common questions regarding bruises. 1. How long do bruises last on the face? A bruise on the face will disappear faster than one on the legs. It will be blue and then purple for up to five days, then turn green and yellow, and should be gone within 14 days. 2. How long do bruises last on the arms? A bruise on the arm is similar to one on the face. As a general rule, the bruise should disappear within 14 days. If not, see a doctor. 3. How long do bruises last on the legs? Bruises on the legs seem to be the ones that take the longest to heal, especially when they are on the fleshier inner thighs. 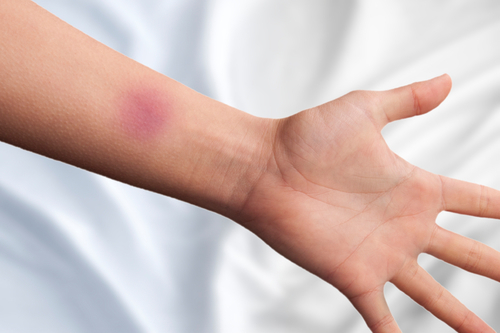 These bruises can take up to six or seven weeks to heal completely, and they will hurt much more than a bruise on the arm or face. 4. How long do bruises last on the lips? A bruise on the lips, because it should be relatively small given the area of a lip, should take about seven to 10 days to heal. 5. How long do bruises last after giving blood? Giving blood and then bruising means the technician who drew the blood likely wasn’t very skilled at taking blood, or that your veins are small and fussy. Either way, a bruise is a bruise and it should disappear within the standard seven to 14 days. If not, see a doctor. It actually is possible to have a permanent bruise, but the likelihood of this happening is extremely rare. In such an unlikely circumstance, the blood from broken capillaries can remain and almost tattoo the skin, in a manner of speaking. Or it could just be that the bruise is taking much, much longer to heal. In any case, if this happens, it’s best to have it looked over by a healthcare professional. Age: The elderly bruise much more often. Gender: Women tend to bruise more than men. Medication: Certain medications make you more susceptible to bruising. Skin: How tough the skin is. Illnesses: Certain diseases can increase the odds of getting bruised. How long a bruise lasts depends on where the bruise is and how hard you were hit, among other risk factors. The best option is to try to avoid getting bruises altogether so you can avoid the pain and discoloration associated with them. Below are some tips to help prevent bruises. If you tend to be clumsy and bump into things often, consider removing furniture with sharp and pointed angles from your space. Alternatively, you could cover them with soft, rounded corner guards. If you can, help elderly people to sit down and stand up so they don’t lose balance and fall. Generally, try to be more attentive and watch your surroundings. “Itchy Ear Remedies,” NHS Choices web site; http://www.nhs.uk/chq/Pages/1057.aspx?CategoryID=72, last accessed March 18, 2016. “Bruising Easily or Bruises that Last a Long Time,” Helping Teens web site; http://www.helpingteens.org/articles/general-health/132-bruising-easily-or-bruises-that-last-a-long-time.html, last accessed March 18, 2016. “How Long Does it Take for a Bruise to Form after Being Hit in the Face?” Helping Teens web site; https://www.quora.com/How-long-does-it-generally-take-for-a-bruise-to-form-after-being-hit-in-the-face, last accessed March 18, 2016. “How Long Does a Deep Thigh Bruise Take to Heal?” Peconic Puffin web site; http://www.peconicpuffin.com/the_peconic_puffin/2010/04/how-long-does-a-deep-thigh-bruise-take-to-heal.html, last accessed March 18, 2016. “Is it possible to have a permanent bruise?” Quora web site; https://www.quora.com/Is-it-possible-to-have-a-permanent-bruise, last accessed March 18, 2016. “Bruises,” Kids Health web site; http://kidshealth.org/en/teens/bruises.html#, last accessed March 18, 2016. “Elderly Bruising: Risk Factors & Prevention,” a Place for Mom web site; http://www.aplaceformom.com/senior-care-resources/articles/elderly-bruising, last accessed March 18, 2016.